First the seed: My daughter asked me "Are all of your clothes wet like this?"... I had taken an outfit I never wear to her to see if she wanted it. It has been in our hanging locker since before we left home in September. That's it! It's time to clean out that cabinet. All winter long we had been living with constant dampness and downright WETNESS! I had hoped to make it until spring or at least to warmer temperatures before we began the cleaning frenzy... But once you open that can of worms, it's difficult to slam it shut again without following through. Milk stored in an unlined locker... EWWW! What did we find when we revisited the areas previously treated after months of constant damp? 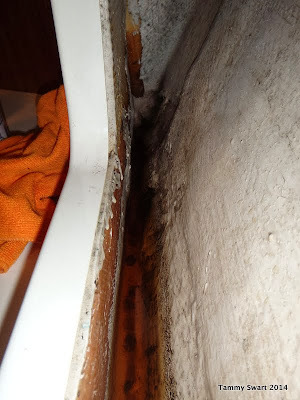 We found out that with a little bit of ventilation, even the darkest corners of the boat can remain relatively mildew free. BUT... that doesn't necessarily go for the stuff that lives in those dark corners... SO many of the paper items were beginning to grow mildew. The cubbies lined with open mesh shelving liners fared far better than the cubbies that went without liners. This was true in the case of mildew as well as rust! About an inch of water stood in the bottom of this cubby. I don't remember why we didn't line all of our cubbies, maybe we thought that the things we were storing there didn't need protection... well whatever we thought, we were wrong. Places we thought would remain dry were totally wet, even standing water in some spots! We took everything out of every cubby! Cleaned out the cubbies with bleach water and retreated the surfaces with Tea Tree. Most were mildew free, but we saw the start of mildew growth in some spots and didn't want to take the chance... We rearranged some things that had suffered from the wetness to more dry spots. We lined the bins that had no liners and repacked it all. Another lesson we learned was that it IS important to remove the paper labels from cans. When we first provisioned, I spent hours removing the labels and marking the cans with sharpie... A comment from a FB friend questioning why, had me reconsidering all that hard work, so I admit that I've been lax with more recent purchases... I'm going back to removing labels after finding that even if the locker wasn't mildewed, the dampness set in and made a mess of these paper labels. Some of our shelf liners were a wet mess. We went looking for alternate methods to line the galley cabinet where we keep pots and pans. We had what we consider to be a stroke of rare brilliance that we will now share with you... We bought a bathmat to use along the hull. It is mildew resistant, provides a pad so that pots don't rattle on the hull and comes with it's own suction cups to keep it in place! It even came in the perfect size for our space! SCORE! We lined the floor with another type of shelf liner and added a small waste basket to hold the lids and small storage containers that are always rattling around in there... and we're SET! I love the clean new look and have ordered a second mat for the upper shelf hull-side. Because of the length of time it takes to dry these spots after cleaning, we didn't finish it all in one day. So... today, even though the sun is now shining. We will be hard at work cleaning house. The good news is, we have found a whole bunch of stuff we forgot we had! And not a single... can of worms! Great tip Tammy. The mat will also add a layer of insulation to the boats hull. I would be interested in seeing what the mat looks like in about a month. Well if it doesn't work out I'll be sure to post it somewhere. Remind me and I'll let you know. Alas, the joys of boat ownership. Since you are back to removing the labels from cans again, this will also help to prevent roaches (yes, a topic everyone loves to talk about). Roaches feed on the glue used to affix can labels and cardboard boxes. Once the label is removed wash any excess glue off. Never bring a cardboard box onto the boat (especially in the tropics). Boxes will have roach eggs in the corrugate. Every time you go to a marina, you are susceptible to bugs and rats (yeah sorry, the other thing cruisers hate to talk about). We were tied in a slip about 200 yards from the gate (land). We had some friends over for a glass of wine (or, three). We watched in horror as we saw a rat board the boat next to ours by scaling a mooring line. The rat had no problem scaling the line. We jumped up to try to get the rat off our neighbors boat (he was away and I'm sure under the circumstance would not have minded us boarding his vessel). I'm not sure how we planned to catch the rat (hence the influence of wine). But, we could have at least kicked it off the side. We looked all up and down the boat. It was already inside. Our neighbor had recently provisioned the boat for a trip. Unfortunately, he left the next morning before we were awake. We never had a chance to tell him. But, I'm sure he figured it out along the way. Sorry for the rather disgusting story. Perhaps next time we can talk about head repairs. Yes I had read all about it prior to moving aboard and had spent HOURs removing the labels off the cans and saving only the inside plastic packaging from boxed items like crackers. I had become lazy and left the labels on the more recent purchases though. It was a huge wake up call for us and we're back to removing them for SURE! Thankfully we have had no bugs, that's one of the things we marveled about yesterday when we were cleaning out lockers... no droppings, no sign anywhere. We were lucky we caught the mildew thing in time though. I can't imagine how it would have been had we waited for warmer weather. Thanks! We have since this found some additional floor mats to put in the bottoms of some floor lockers as well. They aren't as cushy but still have the suction cups. I'm glad to share! Every little bit helps! Thanks for your comment! 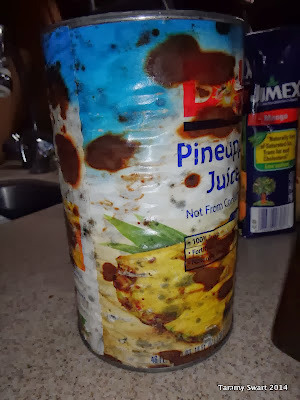 yep I learned the hard way about mildew and paper on cans and boxed foods. I found a way to help beat it....I use air tight slid lock zip lock freezer bags. they come in all sizes I find thr 2 and 2 1/2 gal are great for storing clothes in lockers.. Great write up. We had read up so much beforehand and thought we were pretty much set. This was the first time as real cruisers that we had to deal with this. So, we learned a few lessons about corners we cut and now we know. These lockers were supposed to stay DRY!!! We haven't had great luck with ziplock bags. They just don't hold up as well as we wish. The ones we've used for paper goods have all sprung leaks. There are SO few really dry places on a boat. Whoops!! Time To Renew A Passport!